In order to make it works, you will need a Windows 7 , Vista or XP computer set up with 2 network cards with one connects to Internet and the other one connects to home network. This computer can be enabled with ICS feature and is called ICS host computer. ICS host computer will act as a router to route the traffic from other computers to Internet, also means other computers at home can point to this computer as gateway in order to go to Internet. The ICS host computer must be turned on whenever other computers need to access Internet. 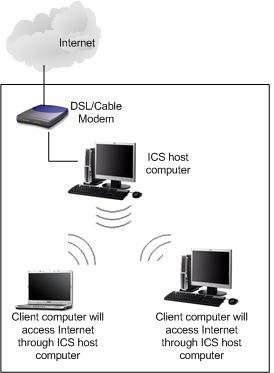 Here is typical home network that client computers access Internet through ICS host computer. 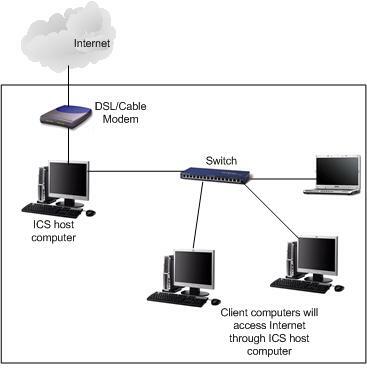 If you do not have network switch but all computers are equipped with wireless adapter, then you can set up ad hoc wireless network between computers and share the Internet connection. 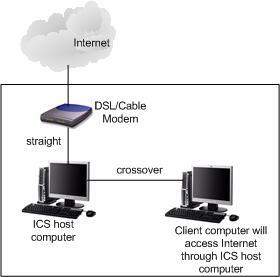 If you only have one client computer, you must connect it to ICS host computer using crossover cable.